“I don’t know how this whole Big Bad Wolf thing got started,” the narrator explains, “but it’s all wrong.” It turns out it’s the wolf himself, who seems surprisingly genuinely unthreatening. (He wears harmless spectacles, and his name is Alexander.) “[N]obody has ever heard MY side of the story,” the wolf complains. And then he describes the time he’d innocently visited his next-door neighbor to borrow a cup of sugar. Now unfortunately his neighbor – a pig – has a lot of silly ideas. (“Can you believe it? I mean who in his right mind would build a house of straw…”) And even more unfortunately, the wolf has a cold, which makes him huff and snuff…and sneeze. “And you know what? That whole darn straw house fell down.” See? It was all an innocent misunderstanding! Smith’s art adds a lot to the book, because the tale is already so familiar. His odd color schemes and flat perspective give the story an appropriate oddness. And some drawings have an abstract feeling, resembling stark and surprising collages. On the first page of the book, the E in “Everybody” is made out of bricks – with straw on the bottom and twigs on top. 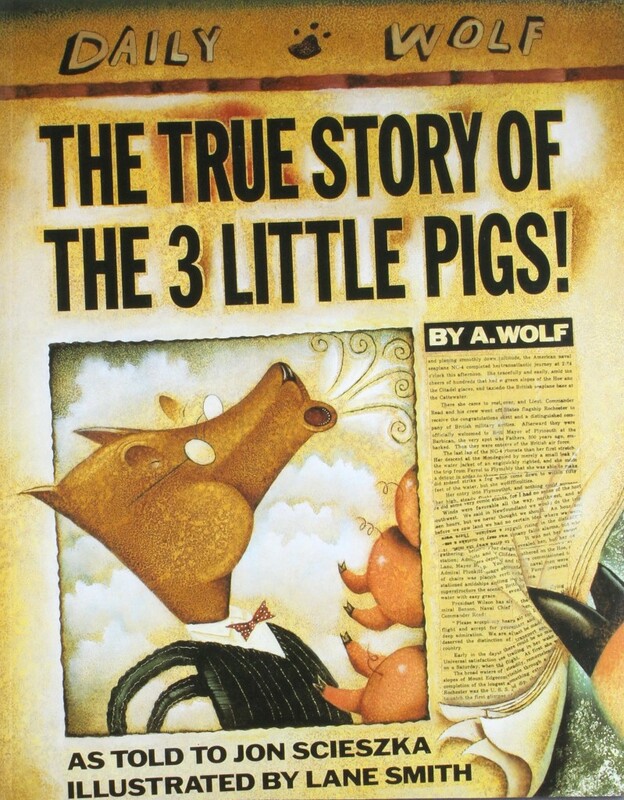 Everybody thinks they know the pigs’ story, but in Scieszka’s version, the wolf is the hero. “Now you know food will spoil if you just leave it out in the open,” the wolf explains innocently. And he’d discovered the second pig dead – after an unfortunate sneeze by his house of sticks. There was only one thing to do…but the wolf still needs that cup of sugar. And the third pig rudely refuses to give it to him, provoking a round of sneezing…right when “the cops drove up.” And it’s in the final drawing that Smith reveals why the wolf’s shirt sleeves was covered with stripes. He’s telling his story…in prison. In a problem, everybody has there perspective on what caused the problem, how it got worse, and how it was resolved. This book teaches children a good lesson on how there is always more than 2 sides of a story. Having multiple perspectives about how a story happens because having different viewpoints helps you truly identify the real problem. This book should be taught and read a lot more often to children.